Tomorrow is July 1st, so you know what that means? If you said the relaunch of The Coil Review, you are sooooo correct. The Coil Review is a supportive space for naturals. Check out their commercial if you haven't seen it already. I knew that people were going to have issues with the BET awards show, I mean the mere fact that Solja Fool started his performance on a bed, was enough to have me pull the plug on my tv, throw it out the window and forget that BET ever existed. However, I will say that with such short notice I thought they did well based on the two day time span. They literally changed the entire scope of their show, but many have written in on message boards and blogs to say that BET should have waited until they could do a proper tribute. Indeed that may have been more appropriate but I guess they wanted to strike while the iron was hot. And will Janet make any more tribute appearances? I think not, at least not any time soon, so that was an opportunity BET didn't want to miss. Some of the vocal performances were a mess, clearly, but I can understand the attempt that BET was trying to make, whether it was well executed is another story. Outcries on blogs also responded overall on how poorly directed BET has become, and I don't disagree. If I am not mistaken Viacom is still controlling things at BET so I didn't really expect things to get better when that takeover occurred. What begam the demise of BET? As a kid I remember waiting up just to see Tavis Smiley talk about issues that mattered. Despite whatever really happened with his dismissal that was one moment that I marked in my young mind as the beginning of the BET downward spiral. Now I can tune in to see a news brief by a young man (don't know his name) who speaks like he has marbles in his mouth. The well tailored suits of Mr. Smiley have been replaced by baggy jeans and timberlands. I am seriously waiting for that BET guy to show up one day with a du rag on and a tooth pick in his mouth that is all he is missing to complete his look. Now we have the Tiny & Toya show which is set to air tonight.....sigh. Correct me if I'm wrong but I believe one of the commercials for this show said that Tiny and Toya want to show how independent women take care of themselves.....HUH? Shaking my head. What do you make of BET? The Zoya exchange program is great! 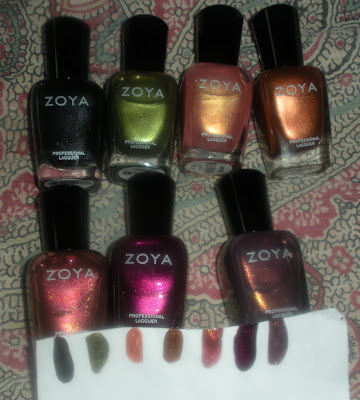 I forgot to mention the Zoya personal touch in the video. You get a little piece of paper teling you exactly who pagacked your item- thanks Chris :-). Any thoughts? Clearly BET switched gears very quickly to turn the show into an MJ tribute and they did well especially with such short notice. Seeing New Edition (ALL OF THEM) was a good moment. Again maybe because some people were not expecting to sing, their vocals were a bit off. However Keisha Cole, Keith Sweat, Keri Hilson KNEW they were going to perform right???? Jamie, Neyo, Monica, Tyrese, Trey Song (for the most part), Johnny Gill (as always) delivered very well with their vocal performances. 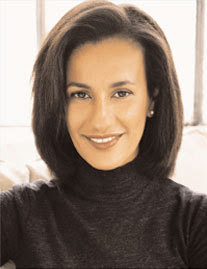 Janet was strong through that tough moment as well as Joseph Jackson for even showing up at that evening. *Note to MC Lyte his name is Idris Elba and he's an actor...ok just had to throw that in there. The Shanayna (spelling) and Ugly Wanda moment was not expected but well received by the audience. Did you catchthe Chris Brown comment in that segment? Oh and Beyonce sang well too. The adorable Keke Palmer even touched the mic for a second. Isn't she just a younger version of Angela Bassett? I am expecting great things from Miss. cutie pie KeKe- though I would love to see less makeup on her. Taraji looked youthful and better than I have seen her in soooooo long. WHAT in the Baby Boy World was that segment with Tyrese and Ving Rahmes? Can we say unnecessary? At least Letoya got to perform even though she was in the blazing heat...shout out to Beyonce's dad for making that happen (allegedly). Jayz's performance yes that was my moment for intermission. With the exception of the BCBG shoes all the shoes were priced under $30.00. I want to thank the wonderful financial blogger Mrs. Money Savvy for the informative comment she posted yesterday. Check out her comment here "Well blogging proceeds are income and all income must be reported and taxed. If a blogger uses an advertising service (such as Google AdSense), that revenue will be reported to the IRS if above $600/yr. Bloggers should be aware so that they're not hit with an unexpected tax bill." Clearly I am not included in this category since my google ads yielded all of .50 since the inception of this blog but this is just an FYI for the rest of you money makers out there. When I shop online whether it's for clothing, shoes or whatever I love to save money so I have no problem shopping the clearance sections. Another thing that I like to do is go to retailmenot.com to see if there are any coupons that I can use before making an online purchase. This site has helped me to get 20% off or free shipping etc. Hey it all adds up so go ahead and shop while saving. Side note- I went into Neman Marcus yesterday and it seemed like there were red tags everywhere with the text 30% off....but when the price is $300-$400 30% off didn't seem so appealing. I saw a few pairs of shoes that looked like the shoes from my post a few days ago about shoes and I have to say in person I wasn't so impressed. I really looked at the quality of some of the shoes and knew that it wasn't worth $100. Especially when it came to a sandal with a REALLY thin sole and barely any fabric so I have crossed some of those shoes off my wish list. Well if the price is really low or I see a great yet inexpensive knock off then I will get it. I left NM without anything and I felt good about it. I think this financial/ clean sweep challenge has made me a more discerning consumer. Did you watch the end of College Hill? Any thoughts? I haven't done one of these posts in a very long time so it is long overdue. This is what I like to call Product Watch, the post where I let you know what I've got my eye on. What has really caught my attention is the sampler mascara kit from Sephora. It is valued at $96.00 but they are selling it for a mere $39.00 for eleven mascaras. What do you all think? Of course it's not a full size tube but you get enough to really know if this mascara will work for you. On a similar note, I have my eyes on some footwear that I NEED in my collection but I am hesitant to pay the current asking price. 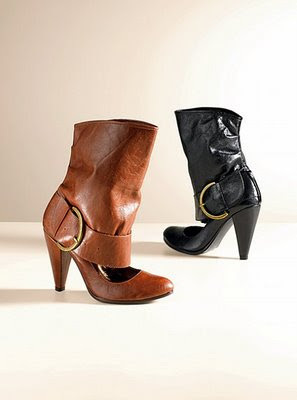 Have you seen these or similar styles reasonably priced anywhere? 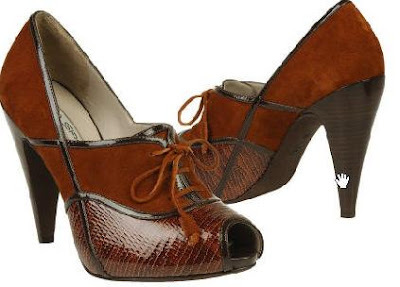 These cuffed ankle shoes will cost me $117.00 at the moment. 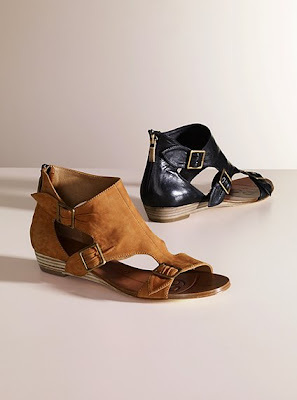 Here are some cute flat sandals with a not so hot price tag of $89.00. I just ordered about 5 pairs of shoes and I purchased about 4 pairs in the weeks past so I am trying to be good here :-). Can you help a sister out? Where can I get these looks for less? Where are all of you ladies getting your shoes from? I heard this morning on the radio that a in the near future bloggers may be required to report all gifts, products and money that they receive in connection with their blogging duties. Any thoughts? Ok so I'm a young old lady, I sit at home watching the food network and sometimes I do it while kitting...ok SUE me..lol. 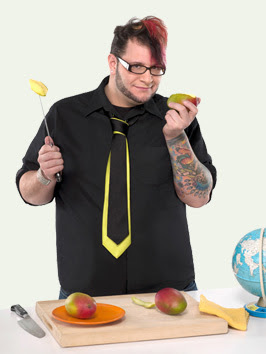 Anyway I am loving this season of the Next Food Network Star. I can really see a woman taking the crown this year and my favorite is 30 year old Jamika. 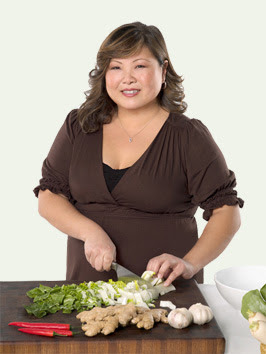 Who stays true to her culinary instinct and Carribean roots. I think the 3 finalists will come down to Jamika, Debbie Jeffery and if one of these three don't make it my wild card entry is Michael (if he can manage to stay focused). What do you think? 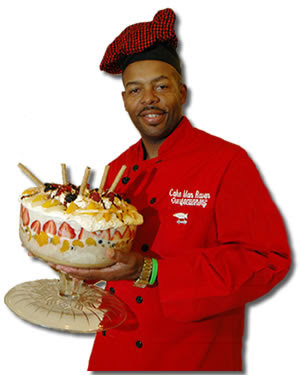 Renowned chef Bobby Flav came to NYC to challenge The Cakeman Raven to a red velvet bake off. If you have come to NYC or you are a lover of sweet treats, you probably heard about the cake man who RUNS NYC. I have never tasted red velvet as delicious as the cakeman's cake. Hello everyone. Today I am responding to a request from a reader and I am giving you a conditioner review. Two videos YAY! What are you gettting into this weekend? I know you are all about sick and tired of me talking about Lush and the expensive products sold at that store but indulge me for just a little while longer. I didn't know that Lush was into giving out free samples, but now I am fully informed and will be asking for samples before purchasing new items. I received a sample of a facial cleanser that I had been considering for a while, Aqua Marina Cleanser. 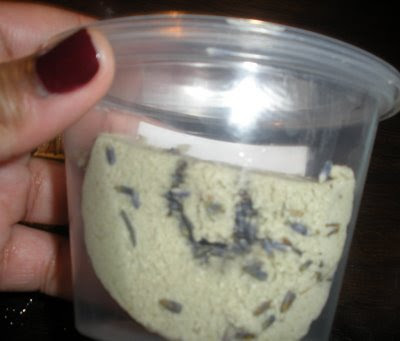 It consists of seaweed,chamomile and aloe vera to sooth your skin while removing dirt and grime. Ok can we just take a good look at the picture, that is the size of the sample I received....WHHHHATTTT??? Anyway I won't complain because it was just enough to let me know that this taffy and spinach like cleanser was not for me. 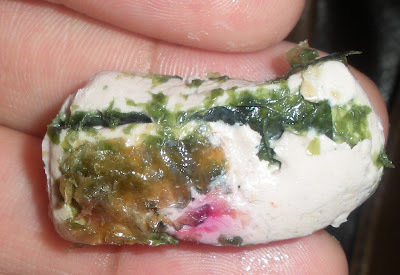 It was like trying to wash my face with spinach and the pink part of the cleanser was like licorice or taffy so it wasn't easy to form a paste when I added water. Now after my face was smeared with this stuff I washed it off and nothing special happened? The earth didn't shake, the sun didn't beam directly on my face and waters did not part, it was a plain ol do nothing cleansers. This sample confirmed that I will never buy this product. I just wanted to sneak in a picture of the Angels on Bare Skin cleanser which I reviewed in the past. I just wanted you to see what $15.00 worth of this product looks like. If you are familiar with actress and model Joy Bryant then you are never surprised at how laid back and simple her makeup and overall look is, no matter how fancy the red carpet event may be. Then it should be no surprise that her simple Bohemian style was written all over her wedding last year. She apparently was pretty frugal too when it came to her wedding. Even though everything looks laid back I have a feeling her version of frugal is still out of my price range...just guessing since her event was in the Hamptons. Anyway check out the bride below, would you wear minimal makeup on your day or will you have a makeup lady/guy on hand to make sure you are always picture perfect? 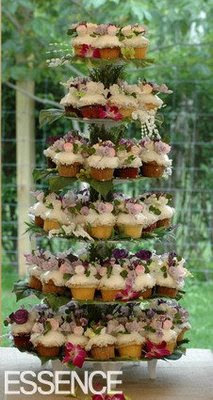 I love Joy's idea of the non traditional wedding cake...I would totally do this would you? 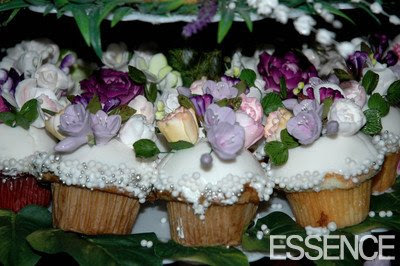 Yes the flowers are edible....GORGEOUS and so up my alley. So are you a traditional bride or not? Do you need a gown by the BRILLIANT creator behind her company Amsale or can you go low maintenance on your gown? I can be do fickle, sometimes I picture myself having a GRAND event and the next day I can picture myself on a swing like Joy....well maybe not a swing but you get the idea..lol. What do you consider to be the items to splurge on for your wedding? How can you look at this picture and resist making this purchase????? A while ago I purchased the Juicy Peach Kernel Natural Hairdressing Creme from Darcy's Botanicals. When the maker of these products said she wanted a product that would reminded her of the peach pomade her mother used on her scalp as a child I was sold. Give me a product that smells like sweet peaches and it can seal in my moisture this is almost too much to handle. This $12.00 4oz jar will last you for a very long time because you seriously need just a dab. I have had this product for months and my jar is perhaps half way empty now. As you rub it between your fingers you see that it is an oily product which is why only a little is needed. I can see myself buying this product well into the future. It is marketed for "locs, braids, twists, waves, afro, and even relaxed hair". Ingredients: Peach kernel oil, vegetable thickener and conditioning oils. 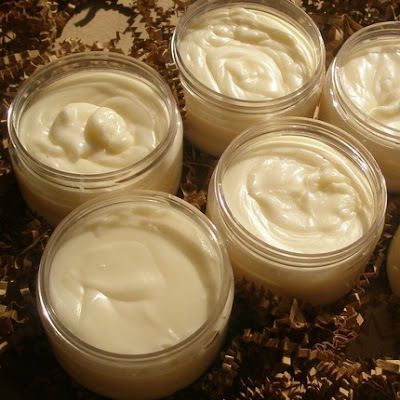 DB products are handmade natural goodies whipped to perfection. If you are old enough, you remember huge pants, shiny shoes and fast foot work as symbols of the MC. Hammer era. As the story goes, he was such a generous man to his friends and family members that he eventually met his financial demise. Well it may be Hammer time all over again because he has a reality show which started last night. I totally missed it but I was planning on supporting him by watching. Did you watch MC Hammer and his family last night on A&E? It seems like Essence magazine always has an article that features tips that one can use to get that promotion on the job. After reading the article I don't know which woman wouldn't feel empowered to walk into an office to confidently and respectfully get her due. Well on a somewhat personal note, I have a co worker who has been demanding her due almost as long as I've been alive but to no avail. On a positive note, she gets her work done and is known for her efficiency. However, each time she has walked into her supervisors office asking for a promotion she leaves with promises that have yet to be fulfilled. She has had a few different supervisors over the years with each one commending her on a "job well done" and making comments like you need to become the (insert better title here) but they never follow through. Other than packing up and heading out the door, which I don't think she is prepared to do at the moment, what can she do to get more respect while collecting the money she deserves? What have you done? Did you check Tracyee out this weekend over at KISS? If not mozy on over now and look at her progress...I already told her I need those shoes in my life..lol Congrats Tracyee. My review is below but first I want to tell you about a special offer. Alicia from Whooga.Com is offering $30 towards any purchase made on the store sight. Whooga boots look just like Ugg boots to me so if you want a pair you can get $30.00 off. Here is what Alicia had to say "All your readers need to do is visit our website at www.whooga.com and enter the code PRODUCTJUN into the box in the cart. There are no conditions on it and we do ship to all countries." I have never purchased Whooga boots but if you do come back and let me know how they feel. Please ignore the rollers in the background, I was about to do my hair. 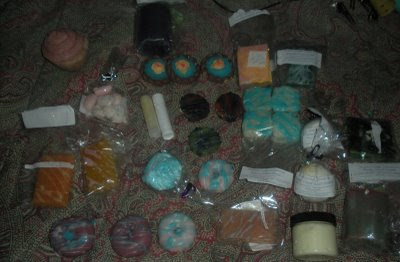 You are looking at my soap haul from Anita's Crafty Creations. Check out my review below. 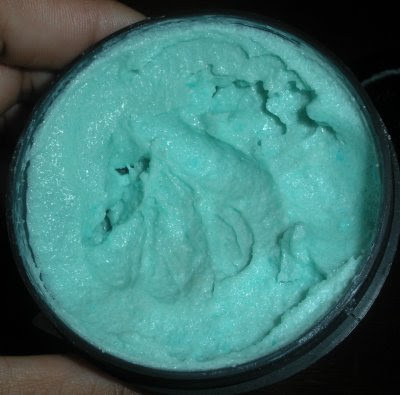 The frosty sea of blue that has captured your attention is Ocean Salt Cleanser by Lush. 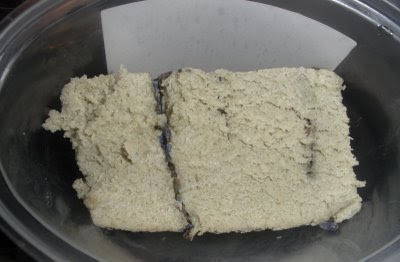 It can be used on your face or body to exfoliate your skin. Let's make no mistake about it, this is not a light scrub, I mean think about it, this scrub can also be used to smooth down your legs. I do use this on my face but not often, because I do not want to rip my skin to shreds. In my opinion, this is not a scrub that you can use daily, twice a week maybe. It is also recommended that you put a little water on your face first to make the salt grains dissolve a bit so it is not as abrasive on your skin. I used this on my body and loved the results. After all, smooth legs make the world go round :-). Now at Lush prices you know this baby wasn't cheap so I got the smaller version and paid $18.00 for 4.2 oz. I feel like I'm that kid in grammar school who is surrounded by bullies who are pointing and laughing at me. I don't remember a time I received so many emails about close out sales and save 50% off so I'm starting to think these companies heard about my financial/ clean sweep challenge lol. Just like you, I received the code, HONEY, from MAC to get free shipping on any purchase I make from the Naked Honey Collection. Honestly based on the color palette I'm not that impressed anyway so this is not a tempting offer, but had I not been on this challenge who knows what I would have been inclined to purchase. I received discount codes from Victoria's Secret to JJill and every store in between. Then Komaza sent me an email saying they are overstocked on their Almond Milk Cleansing Conditioner so they are selling it for 50% off. Now I have never used this particular Komaza conditioner but if there were ever a time to try something new, it's when it's being sold for 50% less. But alas I will not be buying a conditioner because I don't want to part ways with my beloved hair products. Actually I took a peek last night and there are a few things I can give away so who knows if my fingers will do some Internet shopping later today but as of right now I am going to resits. What better way to get back at those taunting me than to shove my credit card back in my wallet and walk away. 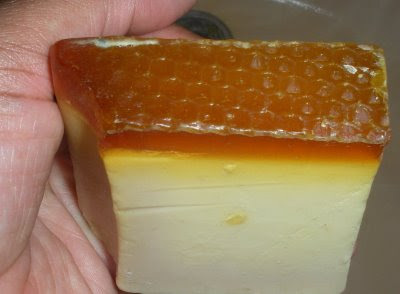 The soap of the day is Honey I washed the kids, a honey and aloe vera infused soap for your body. 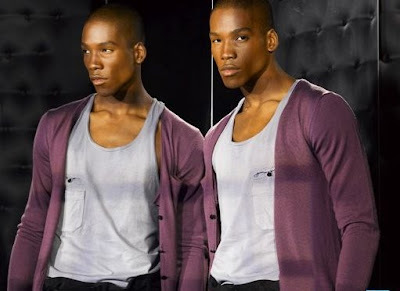 Have you seen the My Black Is Beautiful series features on the BET website? I know, I know, many of us avoid BET like the plague but from what I have seen so far, this series is great. It focuses on the beauty and diversity of people of color and then they show hair and makeup tips and tricks that can teach us how to highlight our best features. On another note, did you see College Hill last night? Is Milan a spoiled brat or misunderstood? Are you bored by the Housewives of NJ? What is your most effective facial cleanser? I am hearing so much about cetaphil...what do you think? There was another great suggestion but I forgot it...sorry. Are you familiar with these magazines? Unfortunately, the charismatic man who DOMINATED the catwalk, Sandhurst, didn't win "Make me a Supermodel", but second place is nothing to sneeze at...congrats Sandhurst! Now on to my video!!!! I promise you this order was made before I started the financial/ clean sweep challenge. 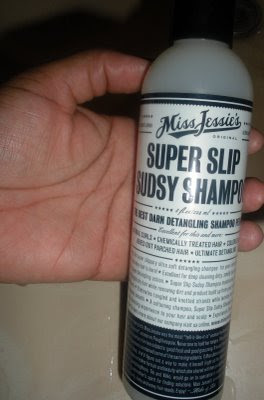 As you may recall from my last haul video I purchased the super sudsy slip shampoo from Miss Jessies. I tried the shampoo and I was looking to see if this would prove to be the " best darn detangling shampoo period" as the bottle proclaims. I noticed that my almost 10 week post hair was being detangled with relative ease but something far more appealing caught my attention. Whenever I shampoo my hair, after washing out the product I take a towel and gently remove excess water so that the conditioner can really reach my hair. When I removed that excess water believe me when I tell you my hair was as soft as any shampoo has ever made it feel. Dare I say that my hair has never felt that soft after it's been shampooed. I literally wanted to skip the conditioner and just dry my hair hoping that it would maintain that level of softness after it dried. I decided to go ahead and use the conditinder but I was so pleased with the shampoo. So what's the big decision I had to make? Well take a peek at the ingredients list on the other picture, see anything wrong? You can click the picture to enlarge the photo to get a better view. Yes, you may have noticed that chemicals and parabens are running a muck all up and through the ingredients list. The ingrediets are sooooo not in line with the natural products I like to use. It took me a while to make a decision between buying products with not so good ingredients that give me great hair vs. natural products that give me good results but may not be as effective. Well sadly I have to report that I purchased 4 more bottles of this shampoo lol I know, I know, you don't have to say a word hence my financial /clean sweep challenge below LOL. However, after my 4 bottles which I plan to use sparingly, are done I'm back to natural ingredients!!!!! What would have been your decision? Do you use Miss Jessies products? If you don't want to watch the video below, the recap of what the videos addresses is below the videos. I need to make a change and maybe you do to, so I want to start a financial/ clean sweep challenge. This should really help me to save even more money and get rid of any product related clutter that I have accumulated. 1) After paying for your necessities like your mortgage, light bill etc. you must save at LEAST 80% of the remaining money. Certainly you can save more but try your best to stick with the percentage that you select for the entire month of June. So if you have $300 after paying for your NEEDS then you will save at LEAST $240 which means you will have $60 to play with. 2) Here is the clean sweep portion of the challenge- if you buy an item that you can classify as a want not a need then you have to give away two items of the same type. For example, if I decide to get a new nail polish I have to give away two polishes. Doing this will hopefully eliminate unnecessary purchases while reducing the number of items that we have. IF you can think of any other rules please let me know. I will do this for the entire month of June and I hope you will join me. Keep a tally of how much you have saved by the end of June and keep track of how much clutter you eliminated. Remember when MAC released their black volcanic ash exfoliator and everyone went wild, well at least I did. 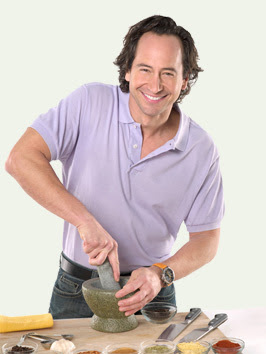 Giovanni has a detox system for the body that features a body wash and scrub infused with volcanic ash. Remember that Giovanni is a line that produces products paraben free and all around better ingredients. After using both I really like both items. Now how can I tell if this black body gel is detoxing my skin????? I don't have an answer for that but I did a silly little test, I created a stain and used two different body washes to see which would clean the stains the best. Hands down the detox body wash turned that t shirt back to snow white must faster than the body shop body wash. So what's that mean, not much maybe so I had to base my real feeling on how my skin felt. My skin feels smoother after the body wash than it does with other body washes, well better than it feels after I use most store body washes. The scrub is really nice, fine grains that still give you a very nice scrub down. You use it after the body wash to further smooth down your skin. The body wash cost me $13.99 while the scrub was priced at $10.o0. I thought I saw this with a lower price tag in another store but I just can't recall at this time. I didn't buy the lotion because I thought it was an unnecessary purchase. I did it, I used the soap from My Honey Child and it makes my skin feel clean and soft. However I don't think it feels nice enough for me to ignore the scent of her soaps to shell out $5.00 again. I know that $5.00 isn't too much money but I can get other soaps for that price that make my skin feel better and it has a better scent so I won't repurchase. My Honey Child makes great hair products so I will stick with her for those items only. Good attempt though and remember this is just my personal scent opinion, others may buy it and LOVE it...so try it if you feel inclined to do so. I have a challenge that I want to start on this blog. Please check in tomorrow for details. I hope you will join me!!! !